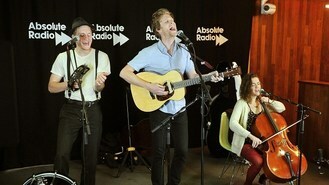 The Lumineers have praised British festival crowds for going "wild" for them this summer. As well as playing their first ever festivals in the UK this year, they are also celebrating their self-titled album going platinum. Bassist Benjamin Wahamaki said one thing he wished he could change was the weather. As a shower of rain hit the largely sunny Reading site on Sunday afternoon ahead of their main stage set, he said: "I thought we were finally going to get to play at a UK festival when it wasn't raining." Pianist Stelth Ulvang added: "Leeds was so muddy. It was worse than Glastonbury." Describing the reaction they had on Friday in Leeds, Wahamaki said: "It was great. They were more of a rock crowd, but still excited to be there. Some of us went out into the audience and they were pretty crazy." Ulvang added: "We got pretty close up to them. We had to retreat quite quickly and get back onto stage." The band, headlining the iTunes festival in London next month, said they were pleased there were so many good bands on the Reading/Leeds line-up, adding they had seen the sets by Nine Inch Nails and System of a Down. Wahamaki said: "It's pretty wild. Even the name is legendary. You always hear about people's Reading and Leeds gigs. It's surreal to be here ourselves. We'd be pleased if just 200 people came to see us. It's such an honour for us." He said he was surprised by how quickly the band's popularity had grown in the UK, less than a year after they first performed here. "We've been thrilled," he added. Lance Bass has insisted N Sync have no plans to reunite following their performance at the MTV Video Music Awards. Justin Timberlake scooped a haul of prizes at the MTV Video Music Awards but it was his reunion with boyband N Sync that had tongues wagging on the red carpet before the ceremony. The MTV Video Music Awards are all about Justin Timberlake. Singing brothers Richard and Adam have become the first act to spend four consecutive weeks at the top of the UK album chart this year. The Charlatans' singer Tim Burgess said the band will meet in the coming weeks to discuss their future following the death of drummer Jon Brookes earlier this month. Rapper 2 Chainz was one of 11 people arrested after refusing to get off a tour bus for almost nine hours following a traffic stop in Oklahoma City, police said. Blurred Lines singer Robin Thicke celebrated his chart topping year as he kicked off the festivities ahead of the MTV Video Music Awards. Lissie has said the long gap between her first and second albums wasn't planned, but that the festival scene exhausted her. Editors said the departure of guitarist Chris Urbanowicz was a "traumatic, heartbreaking time" for the band but a new line-up has left them revived.